Tiffany's Online Finds and Deals: Wax Warmer Hair Removal Kit with Hard Wax Beans and Wax Applicator Sticks ONLY $9.72! 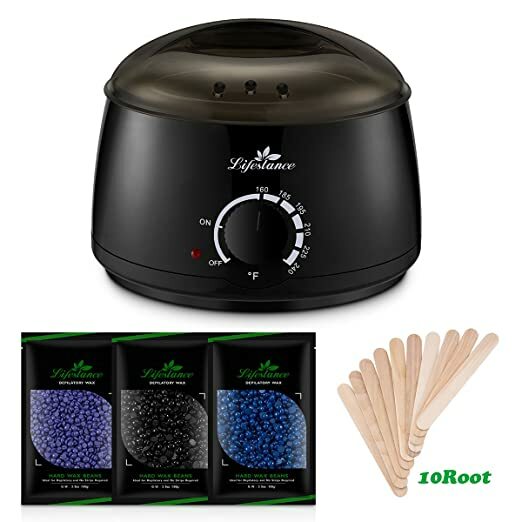 Wax Warmer Hair Removal Kit with Hard Wax Beans and Wax Applicator Sticks ONLY $9.72! SHIPPING is FREE due to amazon offering free shipping on all orders even without an Amazon Prime Membership! √ FDA approved 1 year warranty,For whatever reason you don’t love Lifestance wax warmer kit, let us know so we can give you a full refund or send you a replacement, NO questions asked. Click the "Add to Cart" Button NOW and become the captain of your Beauty! Lifestance Wax Warmer Electric Heater • ABS construction body and aluminum pot • Durable wax warmers for multiple treatments or extra large waxing areas • On/off switch, easy to use • Red indicator light on while heating • Adjustable temperature settings of 60-120 degrees Fahrenheit • Removable inner wax pots • 4.3" pot opening to accommodate most wax containers • Stylish design for any professional salon or home • USA Standard Power-Cord (110V, 4 Ft Long) • Fit for 500ml wax Specification • Wax Warmer Overall Dimensions: 7"x7"x4-3/4" • Working Voltage: 110V • Power: 100 W • Frequency Range: 50Hz-60Hz • Removable liner wax pot internal size (Dia.xH): 4.3"x2.9"(11x7.3cm) Package • 1x Wax Heater • 10 x Wax Applicator Sticks • 1x 3 Pack of Hard Wax Beans Warnings: Warning Text: Keep out of reach of children. ❤Please DO NOT test the temperature of the wax with your finger but use the tools. Heated wax can be extremely hot, and may cause burns! ❤Please make sure that the WAX POT is DRY when you put the wax into it; otherwise it will get burned!